The YPLF is a wonderful American Philatelic Society program to support youth in philately. Seasoned philatelists, societies and organizations are invited to "give back" by sponsoring a Fellow. Sponsorship of a Fellow for one year costs $5,000, but smaller gifts are encouraged. A YPLF Mentor meets with a Fellow to guide and instruct the young collector in his or her chosen track. The vision of the YPLF is to allow youth, who have already shown an interest in stamp collecting, an enriching and dynamic experience with a specific aspect of the hobby. Junior and Senior Fellows, after an introduction to the program, will choose one of three tracks on which their year will focus: Dealer Track, Exhibitor Track, and Author Track. Left to right: Sarah Chenevert, Cassi Stahl, Trish Kaufmann, Sabrina McGill, and Emily Kuhl. 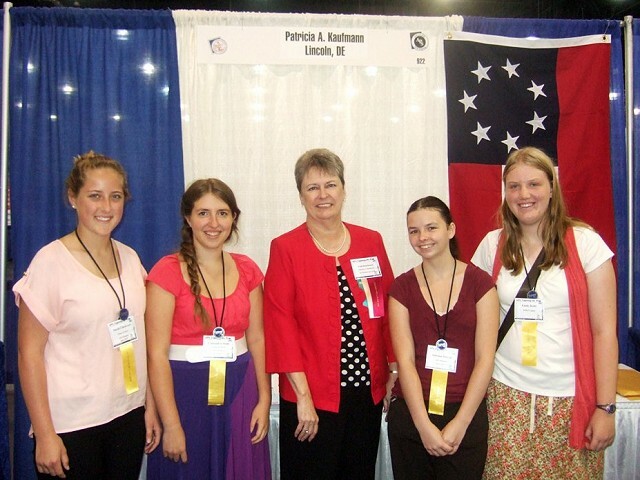 The young ladies of YPLF 2013 pose with Trish in her booth at StampShow 2013 in Milwaukee. Trish is an enthusiastic supporter of this program and was thrilled to see the women outnumber the men for a change. In her youth, Trish was often the only woman participant in various aspects of the hobby. Much more information and applications to YPLF can be found on the APS website under Young Philatelic Leaders Fellowship.